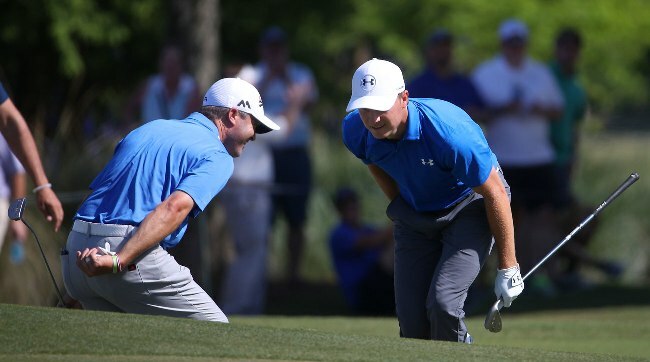 From all reports the team format at the Zurich Classic was well received by golf fans and the golf media. What was your take on it? Jim Deeks, Fairways Magazine (@jimdeeks): I will admit to being the worst type of shallow, superficial golf fan. Because most of the big names had been eliminated by Saturday afternoon, I avoided watching it until late Sunday. The Kisner chip-in was pretty exciting. But other than applauding the Tour for trying something new, I can’t say whether the event was a riveting success or not, because my eyes weren’t on it. Craig Loughry, Golf Ontario (@craigloughry): Loved the Zurich partnered event. I was amazed by the scores and interested in who partnered with whom. Some tweaks are needed around eligibility, I didn’t like the fact players who do not own a PGA Tour card were able to play, while those who hold a card could not (i.e. Brad Fritch). Also, that members get Fed-Ex points depending on finish. None of that seems fair to the actual card carrying members of the Tour. I’m certain there will be tweaks. Dave Kaplan, Freelance Writer (@davykap): I really enjoyed the team format and all that came with it: the goofy matching clothes, the team-oriented strategies, and the camera shots of four different people reading a single putt at once. It looked like the guys were having a lot of fun out there and that made for a livelier and more entertaining broadcast. Plus, there were tons of alligators and we got an early candidate for shot of the year with Kisner’s eagle chip on the 72nd hole! I’m already looking forward to next year’s Zurich Classic. TJ Rule, Golf Away Tours (@GolfAwayTJ): Unfortunately I didn’t get to watch any of it this weekend, but I always enjoy team events, and I think it’s a great change. I wouldn’t want to see it every week, but it was a nice change from the normal every day golf tournament. I do think they should change the format to end with alternate shot though, to put more pressure on the guys on Sunday. Hal Quinn, Freelance Writer, Vancouver: The best part was the one stroke penalty for slow play in the first round to team Carbello-Campbell. The stunning, and shameful part, is that it was the first slow play penalty on the Tour since Glen “All” Day was hit in 1995. If this were a “normal” and not a novelty event, they would not have been penalized. The tourney was great, but this was the best part. Expect the next stroke penalty for snail play in 2039. Peter Mumford, Fairways Magazine (@FairwaysMag): It was good TV. I was surprised at how many non-PGA Tour players were in the event. That’s not a good sign. Either not enough regular Tour members embraced the format or some were excluded in favour of friends and relatives. Both are danger signs for this format moving forward. If the PGA Tour were to add another event utilizing a format other than the usual 72 holes of stroke play, what would you like to see them try? Deeks: I was chatting on the weekend with my nephew-in-law, who’s a sports marketing superstar (a kid from Elgin, ON, now VP Marketing with an NFL team), and we both agreed that it would be great if the PGA and LPGA could jointly create a mixed team event, perhaps with the same format as Zurich. And with equal pay, of course. Other than the necessity of different tee blocks, I think the women could and should be given the opportunity to show that they can play as well as the guys, from fairway to bottom of cup. Loughry: A combo scramble, four-ball, foursome event, 54 holes, and create exhibitions on the other days for fans and players to celebrate the game. A Big Break format or par 3 contest like at the Masters – skip the ball across water, or Drive, Chip and Putt for the Tour players. Give me anything different! Kaplan: I’d like to see a four-day tournament where players can only use a putter and their choice of one wood, one iron, and one wedge. Also, everyone in the field must wear high socks and old-timer sport coats. No exceptions! Rule: Speed golf! Let’s get the guys out there running around the course and add up their total score with the number of minutes it takes to finish the round. Maybe that will help the slow play problems they are having on tour. I think it would be fun watching Kevin Stadler or Carl Petterson in that format! Quinn: I’d like the PGA and LPGA Tours to set aside one week for a mixed team event, with the New Orleans format. The LPGA Tour sorely needs exposure in prime time, and the guys definitely could use more variety in their lives. It would be a big boost for girl’s junior golf in North America and an eye-opener for couch-bound PGA Tour watchers. Mumford: One of the favourites in our Men’s League is the annual 3-club event. I’d love to see the PGA Tour pros play at least one round with just 3 clubs. Maybe they could mix it into a format that included full sets, short sets (7 clubs) and 3 clubs. Advantage to the most creative shotmakers – a dying art in the age of bomb and gouge. A number of highly ranked players are MIA so far this year. (Henrik Stenson, Danny Willett, Bubba Watson, Patrick Reed, Zach Johnson & others) Who’s the biggest disappointment so far in 2017? Deeks: Of the five you mention, I’d say Stenson’s the biggest surprise so far, in that I thought he finally entered the elite player group last year. But what the heck, it’s still only May 1, and there are three majors to go. I’m not sure that Willett’s Masters victory last year wasn’t just a lucky fluke (thanks to Spieth’s hiccups), and he’ll join Trevor Immelman in the “who? ?” category… and Bubba, Reed, and Zach are all fine players, but I suspect there’s no more than 2 majors left in the three of them, and both may come from Reed. To this answer, I might add Jason Day, but his disappointment is more due to health issues than lack of performance. I hope he can still pull something great out of the hat this season. Loughry: I’d say Stenson, he’s by far the better player of those mentioned. I also think it’s a sign that other players are simply playing better, especially younger players such as Rahm, Matsuyama, Thomas, Hadwin, and Pieters. Kaplan: It has to be Bubba Watson. He has four missed cuts and four finishes of 25th place or higher in 10 events this season. Henrik Stenson has arguably been just as bad with four missed cuts of his own in only 7 events, but the guy did win a major last year and at least has one runner up finish this season. Bubba’s last runner up finish was 13 months ago! Rule: Tiger has been my biggest disappointment, but only because it looked like he would be playing this year, and I was excited about that, even if it was a longshot for him to perform well. Of the guys who have been healthy enough to play, I would say Rory has been most disappointing to me. He hasn’t played that poorly, with 3 top 10’s in 4 events, but I was expecting him to come out and have a dominant year on tour, similar to Spieth a couple of years ago. Quinn: There’s never again going to be a Big Three — that IMG creation — but this set up to be a great big three or four season before it wasn’t. Equipment changes are always tough, but the biggest disappointment is Rory not making it a dog fight for the Number 1 ranking. It’s early, so maybe we’ll see it post-honeymoon, if Dustin starts wearing rubber-soled footwear on those ever-dangerous four-step descents. Mumford: It’s a toss-up between McIlroy and Watson. It looked like Rory was itching to reclaim World #1 but so far he’s stalled in the starting gate. Bubba is totally MIA and doesn’t seem to care either. Very puzzling on both counts. Since the reign of Tiger ended, nobody has really occupied the top spot for more than one season, which makes you appreciate even more Tiger’s dominance for such a sustained period. Does Hosung Choi deserve a spot in a PGA Tour event?